1. Consumer awareness: In this age of information, the consumers have become more alert and informative about the quality of food which they eat. With the number of diets and increasing of the healthy eating food options, people are required to know as to what they are consuming is not just safe but is of really good quality. More so after the recent controversy with Maggi, are provingthe consumers have started to take the food safety standard seriously. Thus, foodare proving that they have the FSSAI license, which can give you an added advantage of a solid and an increase in the customer base. 2. Legal Advantage: Most of the businesses identify getting an FSSAI license as an expensive, time consuming and an inconvenient process of documentation, thus they try to avoid getting the license. But, in reality, the process is not so cumbersome and there are a lot of consultancies that can help you get the license with ease. The actual cost which is required in order to achieve the license is less than what you will have to pay for in as the penalties if you are caught. It is thus advisable for any businessman to firstly get the license before you can even officially open your business. 3. 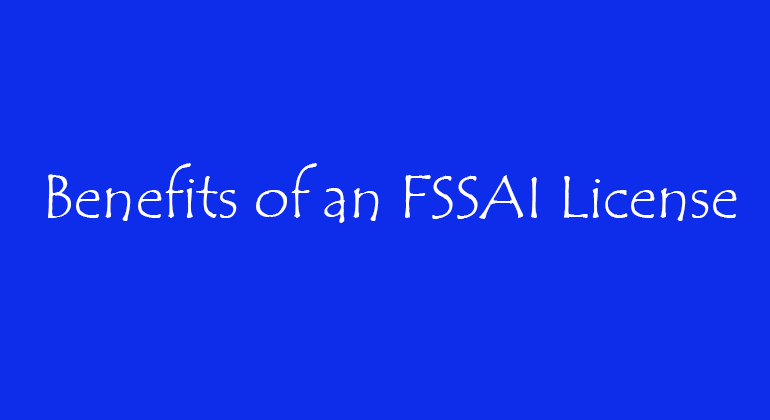 Using the FSSAI Logo: Once you have the license, you can skillfully use the FSSAI logo in your menu cards and also in the pamphlets in order to publicise your food's superior quality over others. This however gives you an edge over the many food operators who are not having the license. All the packaged food are thus required to have an FSSAI number. The logo is seen as a mark of validity and also for assurance by the consumers. In fact, the selective customers want to consume food products specifically who are having the license. It helps you in developing a brand name. 4. Business Expansion: When the time comes for your business to expand in other areas or outlets, you can easily do so with the use of your FSSAI license. The license will help you to establish your reputation and also qualification to grow your business in a new direction with ease. Moreover, the license can also make it easier for you to get bank loans and for funding which is required for expansion. It is thsu believed that there are more than 5 crore food businesses in the country while only 33 lakhs of them are registered with FSSAI. The importance of the quality standard is ever growing and it is beneficial in the short as well as in the long run for your business in order to have an FSSAI license.